Diana is one of the most distinguished violinists in Great Britain, her career spanning a wide spectrum of musical activities. Born in London, she studied with David Martin at the Royal Academy of Music in London, with Remy Principe in Rome and Louis Persinger in New York. After winning prizes in the International Competition ‘Nicolò Paganini’ and the International Violin Competition ‘A. Curci’, she developed a busy international solo career as a recitalist and concerto soloist, playing an extensive repertoire from the Baroque to the Contemporary. She gave the first performance in Finland of the Violin Concerto by Sir Peter Maxwell Davies and is dedicated to the promotion and performance of new works. 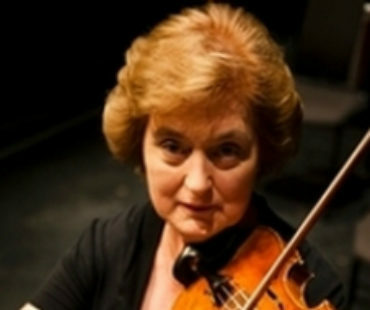 As leader of the Cummings String Trio and the English String Quartet Diana has performed widely both nationally and internationally. The English String Quartet was also the resident ensemble of the London Festival of Chamber Music, a month-long event which during the course of thirteen consecutive years (1995–2007) gave over 200 concerts, bringing an extensive repertoire of both familiar and rarely heard works to audiences London-wide. Orchestrally, Diana has guest-led the London Philharmonic, the BBC Philharmonic, the Liverpool Philharmonic and the Halle Orchestra, and has played with the Academy of St Martin in the Fields and the English Chamber Orchestra. With the London Bach Orchestra she performed several times the complete concerto repertoire of Bach at London’s South Bank, and she was leader and soloist of the Northern Chamber Orchestra and the Milton Keynes City Orchestra. In all these capacities Diana has broadcast frequently and has made many recordings for major labels. Together with the Russian pianist Irina Lyakhovskaya she has recently performed the complete cycle of the Beethoven Violin and Piano Sonatas, and the complete violin and piano works of Brahms and Schubert. Diana has been a professor at TrinityLaban Conservatoire for Music and Dance since 1994 and is a Fellow and professor at the Royal Academy of Music, where she is also the violin/viola specialist for the LRAM Teaching Diploma. She is violin coach of the National Youth String Orchestra. She is also chamber music coach at the International Chamber Music Summer School, and at the International Academy of Musical Excellence and the Chamber Music Weeks, both in Graz, Austria. She is frequently invited to give masterclasses and workshops, and to participate as adjudicator and jury member at competitions and festivals both nationally and internationally.